Saturday my fiancee and I went on a date night in the Mission district of San Francisco, and on our way to dinner at Commonwealth we spotted this cool graffiti wall and jumped out for a few pics. I absolutely love pleated maxi skirts, which you probably already know if you read this post. I mixed this feminine maxi skirt with an oversized moto vest and my favorite Jeffrey Campbell boots to give it a little edge. Great maxi girl! Love the pleats. Your blog is adorbs! LOVE the moto vest. This look is breezy and a little tough at the same time–perfect! Love this look so boho and chic! Cool outfit, and how cool is that graffiti background!! I love the pattern on your skirt! I love how fun this outfit is! Looks great and I love Commonwealth! Love the moto vest with the maxi. The vest adds the perfect amount of edge to the outfit! Super fun! I would loveee to get my hands on a pleated maxi, and you add such great edge to it with that vest and boots! I love this outfit! The maxi skirt is really pretty and I loved the way how you combined it! love this outfit!! so cute, I'm a first time reader and I love your blog! that is such a nice skirt! i love it. 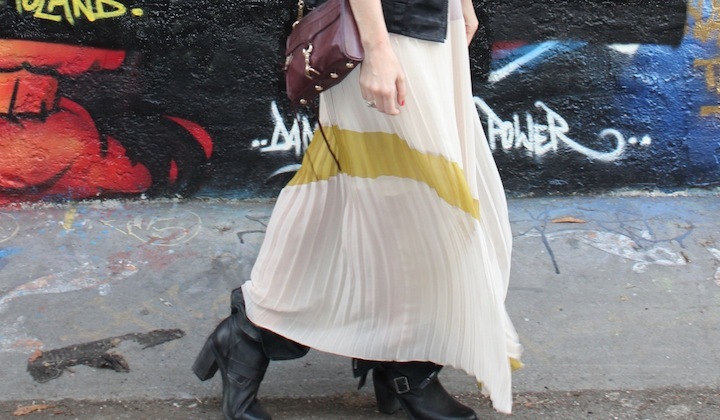 I've been on the hunt for a pleated maxi skirt, this one is adorable on you!! Hooray for outfit pics, you are stunning! Thanks! Those boots are my fave - I have them in brown too! That leather vest is perfect with that maxi - you look so pretty! I love this outfit on you! Reminds me of a mash between boho and biker! Great blog btw! And thanks for stopping by my blog. I'm now following you.